As the publication reports, Pacific Union’s 900 Los Angeles County-based real estate professionals closed $6.2 billion in sales in 2017. Together with its team of professionals in the San Francisco Bay Area, Pacific Union’s sales volume exceeded $14 billion in 2017, making the firm the largest independent brokerage in California. Notable Pacific Union transactions in Los Angeles County include many record-setting sales: the second-largest sale in the history of Beverly Hills ($65 million); the second-highest sale in the history of Malibu’s Carbon Beach ($48 million); the highest and second-highest luxury condominium sales on the Wilshire Corridor ($20 million and $15 million); and the largest sales in Venice ($14.6 million) and La Cañada Flintridge ($10.6 million). 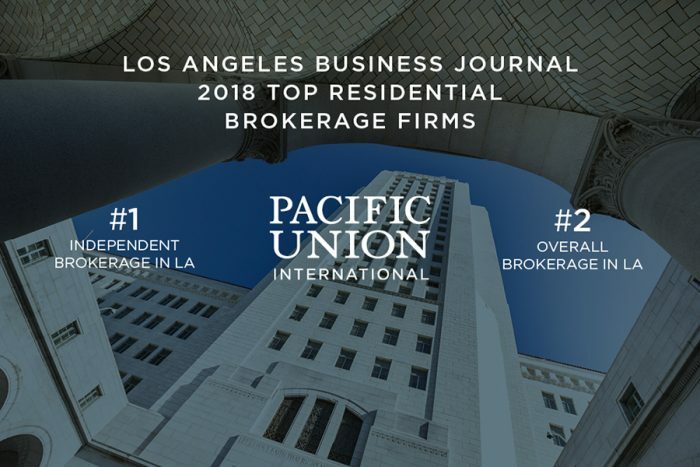 While this ranking is a source of pride and reflects the professionalism of Pacific Union’s team of 900 Los Angeles real estate professionals, the company has its sights firmly focused on continuing the momentum. 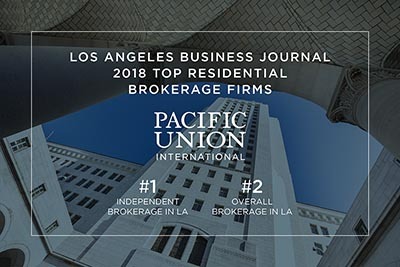 In February of this year, Pacific Union opened a new office in Highland Park, its 20th location; recruited three top-producing teams totaling 18 real estate professionals from a competing brokerage; and hired a leading expert from another major firm as its vice president of business development for Southern California.